The Cat ® M323F is a versatile, high capacity railroad wheeled excavator that gives you the freedom to move from road to rail with ease – without compromising performance. The M323F railroad excavator allows you to expand your work to new terrains. • The C4.4 ACERT™ engine can operate on either ultra-low-sulfur diesel or B20 biodiesel and meets EU Stage IV emission standards. • The engine quickly responds to changing loads while delivering the same amount of power regardless of operating conditions. • Maximize efficiency with load-sensing hydraulics which provide fast cycle times. • The advanced hydraulic system reduces the load on the engine resulting in lower fuel consumption. • Eco Mode and auto engine speed control help reduce fuel consumption while delivering consistent power. • The rated capacity indicator (RCI) and rated capacity limiter (RCL) system ensure machine stability in any track condition. • Powerful and efficient engine delivers superior durability. • Engine idle shutdown, auto engine speed control, and on-demand cooling system reduce fuel consumption. • The dedicated swing pump helps reduce fuel consumption and allows faster and smoother combined movements. • Reach routine maintenance items like fuel and engine oil filters and fluid taps at ground level. • An upper carriage auto lubrication system and minimal undercarriage greasing points reduce maintenance time. • The electric lift pump removes the need to prime the fuel system and fuel/water separator. • The axial fan and all coolers are gathered in the same compartment. Radiators are easy to clean and can be unlocked and tilted without any tool. • The hydrostatic drive on rail axles provides great driving and braking performance. • Highly mobile, the M323F can travel up to 20 km/h (12 mph) on road and rails. • Removable heavy counterweight design allows the machine to meet both railway and road regulations while increasing lifting capabilities and excavation performance. • Rail-specific Smart System allows setting limits to the machine movements and provides real-time implement kinematic/machine rotation position. Movements slow down smoothly when approaching the preset limits. Moves beyond these limits are blocked. • Short radius design complies with railway-specific environments without compromising the excavators’ performance and stability. 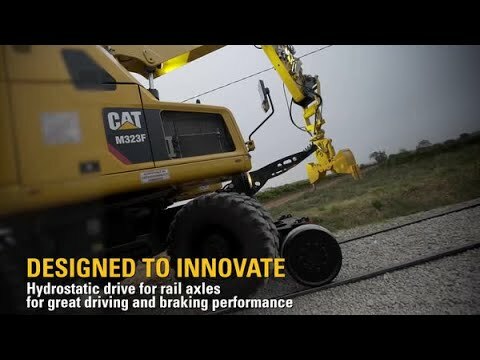 • The combination of a variable adjustable boom and stick provides the right balance of reach and digging force in rail applications and operations. • Retractable hydraulic step improves ground clearance on rail tracks. • Independent hydrostatic transmissions for railways and roads provide optimal performance in both settings. • Double cab provides comfort while meeting regulation. • ROPS operator and secondary cabs are tested according to ISO 12117-2-2008 and meet 2006/42/EC standards. • The Cat® M323F meets all applicable safety standards including EN15746. • E-fence technology limits movement when working under live wires or next to a track that is open to traffic. • The second cab features emergency stop button, backup electric horn, and main machine power switch. • Rail and road adapted smart devices like a seat belt warning indicator, automatic swing lock, and safety lever help enforce safety on the job site. • Long handrails and access steps with anti-skid plates provide easy entry to the cab. • Large glass areas, wide-angle mirrors, a large skylight, rear and side view cameras, and powerful LED working lights provide great visibility from all angles. • Standard integrated pin code adds anti-theft security. • Increase production and minimize operating costs with Cat Connect technology solutions. • Link technologies wirelessly connect you to your job site providing machine location, hours, fuel usage, idle time and event codes. • The easy-to-read, high-resolution LCD monitor will keep you aware of important machine information. • Cat Stage IV technologies are invisible to the operator and do not require any work interruption or operator intervention. • Standard auxiliary hydraulics, including high pressure and quick coupler lines and circuits, allow easy attachment changes without the need to add other lines to your machine. • Preset up to ten hydraulic pump flow and pressure settings. • A large variety of attachments are available, including heavy railway-specific tools. • A high resolution, LCD monitor provides quick access to favorite functions. • Adjust hydraulic sensitivity from the joysticks on both roads and railways. • Adjustable seats, armrests, steering column, joystick controls, buttons, and thumb wheels provide a unique operator experience. • Ergonomically designed cab features minimal and conveniently located controls. Note Operating weight includes medium stick, full fueltank, operator and dual pneumatic tires. Weight varies depending on configuration. Operating weight includes medium stick, full fuel tank, operator and dual pneumatic tires. Weight varies depending on configuration. Note Range values are calculated with GD Bucket 1100 mm, 0.80 m3 with tips K080 and CW-20-H.4.N quick coupler with a tip radius of 1574 mm. Breakout force values are calculated with heavy lift on (no quick coupler)and a cutting edge tip radius of 1237 mm. Range values are calculated with GD Bucket 1100 mm, 0.80 m3 with tips K080 and CW-20-H.4.N quick coupler with a tip radius of 1574 mm. Breakout force values are calculated with heavy lift on (no quick coupler)and a cutting edge tip radius of 1237 mm. Browse through these photos and videos for a closer look at the M323F and what it can do for your operation. Wherever you want to go from here, the M323F is ready. You can get in touch with us in a variety of ways. Check out our inventory of new, rental and used equipment. Connect with your local dealer, ask our experts for advice or read what's happening in the customer forums.